As you can tell, we love Fleece Artist! We just received another incredible shipment including this versatile, Lady of the Lake jacket kit, knit in a combination of Marina and Curly Locks yarns. You can’t go wrong with this easy to knit project and the new colours are stunning! All for only $86.95. Or, if you prefer, the Garter Stitch Jacket kit contains a combination of Curly Locks, Mo, Baby Kid and Kids Curls in a variety of colours. 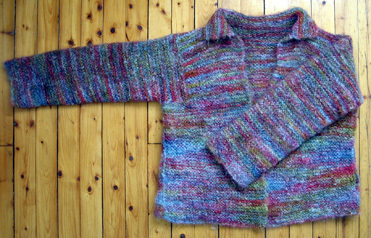 A simple to make keepsake jacket that you will want to linger over as the colours and textures are, oh, so exquisite. What other jacket can you make for $79.95? We also received new Mo and Trina kits as well as a variety of colours of the ever-popular curly locks, perfect for shawls. These projects are very popular, so, don’t be disappointed and drop in soon to see for yourself the wonderful new assortment. Our Special of the Week is Tahi Stacy Charles, Moss Loop-d-Loop, available in a variety of colours. This super soft yarn, made of 85% extra fine merino wool and 15% nylon, can be used to make anything under the sun (or rain as the case may be). Now marked down 50%, originally $12.95, now $6.48. This entry was posted on Thursday, October 22nd, 2009 at 1:58 pm	and is filed under Uncategorized. You can follow any responses to this entry through the RSS 2.0 feed. Both comments and pings are currently closed.